So, a month or so ago, I was feeling the autumn tug. You know what that means. I bought four cans of pumpkin at the store. As one does. I had no idea what I was going to do with them, but that didn’t really matter. I knew I’d figure it out. I used two to make this pumpkin bundt cake, and two to make two batches of these insanely delicious cookies. 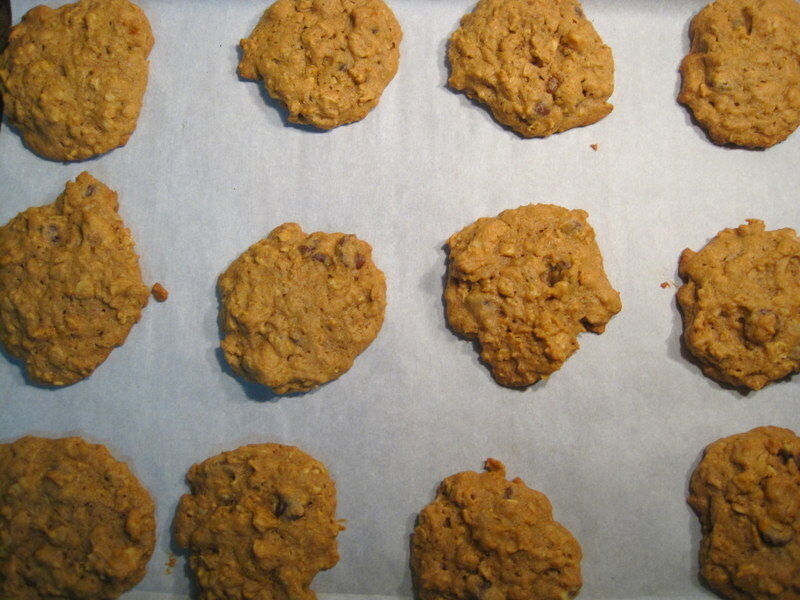 The first batch was so addictive…that a second was necessary. I bit into one last night and told Eric that these are the best cookies I have ever baked. I stand by that. It’s been a cake show around here for a long time, but…I am starting to see the wisdom of the cookie contingency (ahem, Eric). These are just so good. They’re definitely the cousin of the pumpkin bundt cake, but if I could only make one…I’d make the cookies. I had first wanted to make some pumpkin snickerdoodles (which have been all over Ye Olde Pinterest), but when I read the reviews of the recipes, there seemed to be a lot of problems: either the cookies were overly dry or overly cakey. 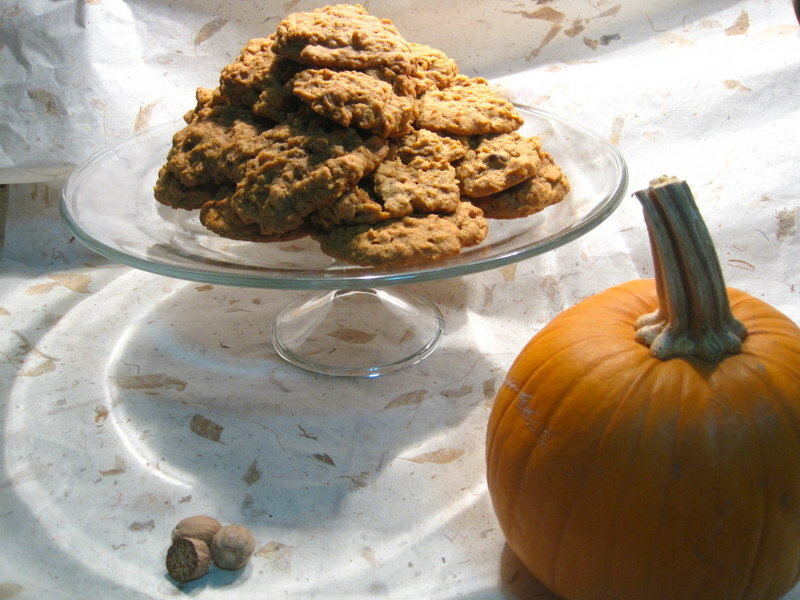 This makes sense, given that cookies have a delicate chemistry, and pumpkin adds a lot of moisture. That’s why I was so excited to find this recipe: oatmeal is the most ingenious addition because it soaks that extra moisture right up. I made a few changes (no cookies should have to endure life without nuts! ), but I honestly think the star of these cookies is fresh grated nutmeg. Mmm, it doesn’t get much better than this. The flavor is so warm and strong in these cookies. I will never tell you how many of them I have eaten. But thankfully there are a good handful left…and more cans of pumpkin at the store. -Preheat oven to 350F. Line a cookie sheet with parchment paper or a sil-pat and set aside. -In a medium-sized bowl, whisk together the flour, oatmeal, baking soda, spices and salt. -In the bowl of your stand mixer (or a large bowl if using a hand mixer,) cream the butter and sugars on medium-high until light and fluffy. Add the egg and vanilla and mix until well-combined and smooth. Stir in the pumpkin puree. -On low speed, gradually add the dry ingredients, mixing until just incorporated. Fold in chocolate chips and walnuts. -Cool on cookie sheet for 5 minutes before transferring to a wire rack to cool. Yes! Definitely the best of both worlds! Oh, good idea! There might be some suggestion in the comments to the original recipe about making them gluten free! Those look really good. I hope there might be a few left when I am out there in a couple of weeks. Just put two in the freezer for you! Love you! I think I’ll make myself some of these babies- while yr Dad is out at your house. I can smell their heavenly aroma now! Ha, good idea! Then invite 20 friends over! It’s a cake & cookie show over at your place! I’ve been waiting to see what kind of cookies these were, ever since your mention of them a few posts ago. They look amazingly delicious. I’m going to make these for sure! Thank you! Oh, thank you! They are so lovely! But I would love to see how you adapt them–maybe pecans or hazelnuts for the walnuts, and maybe, just maybe, a tiny bit of black pepper to heighten the spice? Can’t wait to see how you dress them up! P.S. Amen! 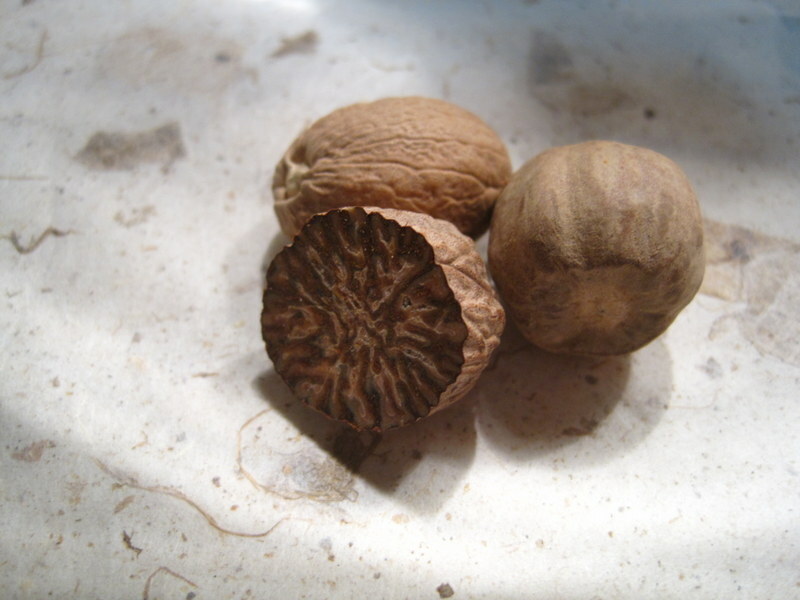 Nutmeg is the best spice ever, especially when it’s freshly ground. 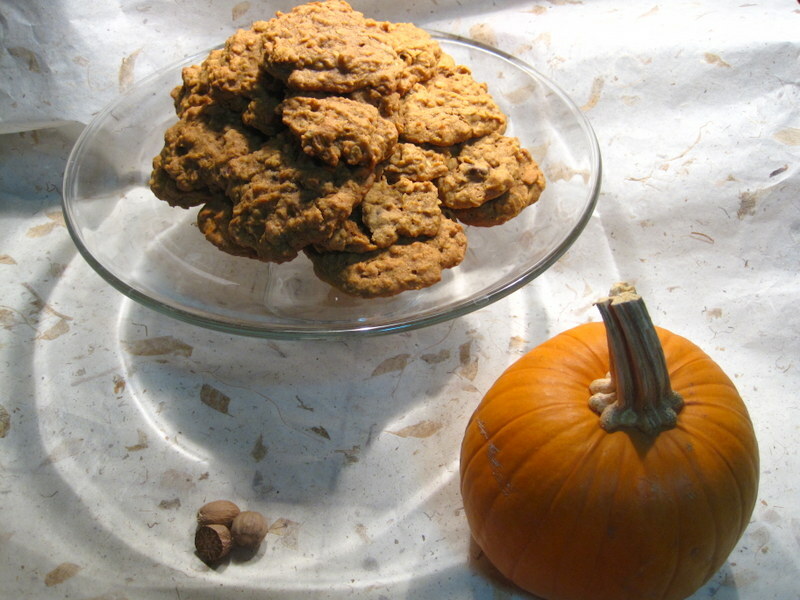 Just in case you were wondering, if one accidentally adds, say a can of pumpkin puree, rather than a cup, one ends up with pumpkin bread cookies that are actually quite edible (though take much longer to bake…). Next time I’ll have to make the recipe correctly (and maybe sleep a bit more), but this ended up a tasty mistake. Thanks for posting the recipe. Oh no! I have done things like that millions of times, I assure you! I am glad they were still good! Probably nice and cakey, I would imagine:) Wishing you lots of sleep!